Don’t we all do this? I love buying just a little something (usually a cosmetic) in order to get a small shopping bag to take for lunches! What I love more is spying the girls on bus and seeing their lunchbags in turn. The whisper of a Neiman’s butterfly, the stately lettering of Marc by Marc Jacobs, the mod ovals of Jonathan Adler, the white-on-black of Barneys, or the elegance of Diptyque – I’ve carried them all for lunches at one time or another. It’s the air of “purchase mystery” that everyone loves to play up for another day, even if the bag holds nothing more exciting than tuna salad with a side of grapes. 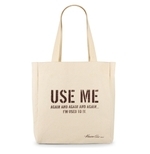 Kenneth Cole "Use Me" toteNow we have our “eco-tote” craze... In the name of eco-chic, designers are now bringing us coveted bags to carry within our bags, just so we have something handy and equally chic to carry home mundane items from the neighborhood grocery or Walgreens. Still, the simple canvas totes are rife with implications of status, location, and income, as they serve as a walking billboard of a person’s demographic. YSL tote as a fashion-show gift bagWithin five seconds, my borrowed eco-tote conveyed a message that someone (me, ostensibly,) had been to New York and shopped at a very exclusive (and expensive) pharmacy shop on the Upper East Side. 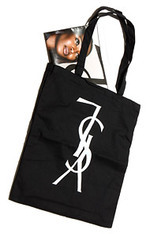 Just like the witty upside-down logo totes being given out for free at the upcoming Yves Saint Laurent fashion show (Eric Wilson's NY Times article), the tote conveys a message of being an insider, being exclusive, being in the right place at the right time to get the right eco-tote. So much more exclusive than a mere Muse bag, don’t you think? Last year, Anya Hindmarch’s “I am Not a Plastic Bag” totes flew off of store shelves and became a hotly-bidded eBay commodity thereafter. According to The Bag Snob, Hindmarch stated at the beginning of this effort: “Our aim with this project has been to use our influence to make it fashionable not to use plastic bas. 'I'm Not A Plastic Bag' was designed to be a stylish, practical, reusable bag that would raise awareness of this issue and spark debate." I would venture to guess that everyone that bought the Hindmarch bag knew about the pitfalls of plastic long ago, but they simply wanted the latest must-have item. Personally, I hate it when someone says they're "raising awareness" - who is some designer to say I'm not aware? The rhetoric just smacks of smug superiority, especially as it concerns something as simple as "plastic is bad for you." Duh! The reason the bags sold out wasn't because of their enlightening abilities, but because everyone wanted to convey that they too cared about the environment while looking exclusive doing it. Whole Foods/Lauren Bush Feed toteAt Whole Foods, you have one of two branded options to purchase there: the standard reusable green bag, or the famous Lauren Bush “Feed” bag – the proceeds of which go to feeding children in Rwanda. Now this is an effort whose awareness needs raising. For just $29.99, you can feed 100 children. Talk about a great product: affordable, well-designed, results-driven, and coveted. Everyone’s happy with this bit of brilliance, and it even zips up into a compact carrying case so your bag isn’t floating around in your handbag causing traffic jams among the wallet, cell phone, and eyeglass case. But charity aside, what does the “souvenir” of your munificence say? This “Feed” tote tells the world that not only do you a) shop at a rather expensive grocery store (Whole Foods), but b) are a conscious, philanthropic being, who c) cares about the needs of children in under-developed countries. Now that is quite the message to send! As with any trend that starts at the street, designers are now capitalizing on these eco-chic totes by designing into the trend and creating new “It” bags. 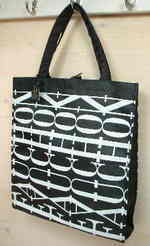 A search for “canvas tote” on Etsy yields over 4,000 items, all made by small-production crafters and artisans. Not one to be late to any party, Target has an entire section on their website entitled “Reusable Shopping Bags” with totes priced from $9.99. Other retailers start out in the market inexpensively, such as the $20 “Use Me” bag from Kenneth Cole, or the $38 “Be Chic Buy Green” tote from BCBG last spring. But now, Marc by Marc Jacobs is putting out screened bags upwards of $100! Other designers are making limited editions, using the classic luxury brand method of creating a must-have item. Luxury branding in a canvas tote? Does that even make sense? Isn’t accessibility the whole point of this trend? Continuing the thought, aren't designers setting themselves up in competition with themselves by creating low-end carry-all totes and high-end luxury handbags? Which bag will attract more attention and draw more covetous envy? Marc by Marc Jacobs "Save My Pole" toteApplying Beaudrillard’s thoughts on semiotics, this trend in eco-totes is really just another way for us to express ourselves. They’re our outward representation of what we stand for, where we shop, and what we want to support. By being conscious of our ecology and ridding ourselves of plastic bags, we have generated a replacement that is literally a blank canvas waiting for expression – preferably a designer one. Of course, if I really want to carry an eco-chic tote with a label, I’ll keep packing lunch in a stylish paper shopping bag like I have for years. Those babies are chic, and free with the purchase of something you're buying anyway!